If you read “About” me on this website, you will discover that I think of myself as very ordinary. I grew up an ordinary girl in an ordinary family in the very ordinary mid-western state of Nebraska. Although I claim a lot of “ordinary” I also feel I have an extraordinary life! It is totally through my relationship with an extraordinary God that my life rocks! 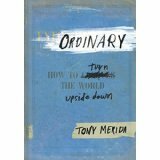 So, when given the opportunity to read the book “Ordinary, How To Turn The World Upside Down” by Tony Merida I was sort of interested. Have you ever started reading a book, kinda haphazardly, and after the first page you were hooked? This happened to me with Ordinary. The first thing I learned is that this author is no “ordinary” fella. He is Dr. Tony Merida. He is a pastor of a church not too awful far from where I live. He is a church-planter. He is a professor. He is writer. He is a lover of Jesus Christ. This is a book about loving your neighbor as yourself. He writes about “mercy ministry.” I didn’t even have an idea what this meant when I started reading. Five chapters and the Conclusion later I know that I want my life to be a reflection of mercy ministry. I now realize that it means not only to care about others but to get my hands dirty. To love my neighbor by getting involved personally. Dr. Merida made me think and really ponder exactly what I am doing for others. Anything worthwhile? From the first page to the last his words found a place in my heart. He spoke to me. Chapter 2 talked about Kingdom Hospitality and I ate it up! Part of me is about food, sharing, hospitality, feeding others. He said “there is nothing more ordinary than a meal.” I totally agree. And then he spent a chapter explaining how we, as Christians, are called to not only love one another but to feed and clothe and care for one another with a “depth and authenticity.” It has made me totally question what I am doing about social injustice, poverty, AIDS, abortion, and so much more. This little 125 page book has given me a great deal to think about when I look at my ordinary life and wonder how much of what I do is done with kingdom intentionality. Dr. Merida quotes many people from Tim Keller to C, S, Lewis. I can totally see this book as the springboard for a small group study, a sermon series, or in my case, leadership development for Community Bible Study. The book is published by B & H Publishing in Nashville, Tennessee. I highly recommend it as an excellent, thought-provoking read. However it really should have come with the label “BEWARE” — you won’t be the same once these words penetrate your heart. I received a copy of this book in exchange for my honest, personal review. Sounds like this book has put a fire in your spirit. Food is the way I serve and I love it. It’s my passion. Some days are long and in a hot kitchen but I’m always glad I did it. And people really are blessed by it.im so thankful The Lord gave me this as a gift and a passion. I thank HIM daily.